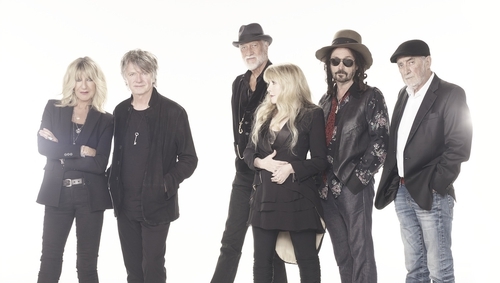 Fleetwood Mac will play the RDS in Dublin next June 13 as part of their European tour with their new line-up of Mick Fleetwood, John McVie, Stevie Nicks, and Christine McVie along with newcomers Mike Campbell and Neil Finn. These will be the band's first European dates since the acrimonious departure of guitarist LIndsey Buckingham last April. Neil Finn of Crowded House and Mike Campbell of The Heartbreakers were recruited as the new touring members of the band earlier this year. Speaking about the new line-up last April, founding member Mick Fleetwood said, "Fleetwood Mac has always been about an amazing collection of songs that are performed with a unique blend of talents." "We jammed with Mike and Neil and the chemistry really worked and let the band realize that this is the right combination to go forward with in Fleetwood Mac style. We know we have something new, yet it’s got the unmistakable Mac sound." "We are thrilled to welcome the musical talents of the caliber of Mike Campbell and Neil Finn into the Mac family. With Mike and Neil, we’ll be performing all the hits that the fans love, plus we’ll be surprising our audiences with some tracks from our historic catalogue of songs," said the group collectively. "Fleetwood Mac has always been a creative evolution. We look forward to honoring that spirit on this upcoming tour." The band will also play Waldbühne in Berlin on June 6, and Wembley Stadium, London on June 16.